Over the past 5 years, gut health & the human microbiome have exploded from obscurity into popular mainstream topics, with new books, podcasts, gurus, websites, blogs, food & beverage products appearing weekly now. Gut health is finally & deservedly front & centre in Australia, with so many suffering from debilitating ’functional gut disorders’ (gut symptoms with nothing detectably wrong with the digestive tract). These functional gut issues, & many, many other health problems almost certainly have gut microbial disturbances at their centre. Choosing to eat gluten free (for non-coeliacs & even for those with no strong symptoms of intolerance) has been a growing dietary trend / necessity (depending on who you talk to) for years now, with 40% of us Aussies regularly purchasing gluten free products & 10-15% consistently eating ‘gluten free’. At the recent Brisbane gluten free expo, we even saw gluten free beer & pies, Aussie coeliac blokes rejoice!! Whilst those with coeliac disease have no option but to strictly avoid gluten to stay well, there’s a lot of controversy re the more casual ‘gluten avoiders’. Some GF people (esp those with diagnosed IBS) have experimented with or changed to a Low FODMAP diet to find relief, & many do – 3/4 of IBS sufferers find it helpful in managing their symptoms. There is a crossover here, as many gluten containing foods are also high FODMAP (ie wheat products). The prediction is that like gluten awareness, (& all things relevant to gut health), FODMAP awareness will grow massively over the next few yrs, as gut-conscious people begin to realise they can make themselves feel more comfortable just by understanding their FODMAP reactivity & modifying intake when needed. More info on FODMAPS here at the Monash University Low FODMAP website. 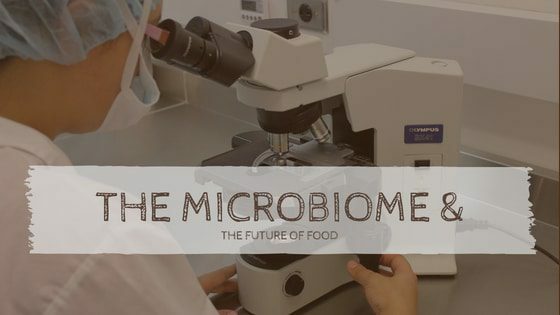 There are so many changes affecting the food industry right now, microbiome research is just one driver – but it’s definitely changing the way we eat & shop. Imagine – just fast-forward 10 yrs to 2028…when we’ve uncovered more of the gut iceberg! This is what I’m Imagining…(some of this is already happening)! 1. We will all have a gut microbial analysis done anytime we’re unwell, babies will all have their stool bacteria analysed not long after birth & then at intervals as they grow, to see how their gut flora is developing & what foods will be best to support optimal health, growth & the development of a diverse & robust gut ecosystem. There will be easy steps to take to improve the gut-immune outcomes for babies who are born via C-section &/or are unable to breastfeed. 2. Antibiotics & other medications will not be prescribed routinely & never without a ‘gut-rehabilitation’ program or procedure to follow / accompany them. Probiotics in some way may become the new antibiotics…& FMT’s (focal microbe transplants) will be commonly used to treat all kinds of disease. 3. We’ll all be choosing food based on how it affects our individual gut bugs (we will all know our microbial profile & have a personalised diet template based on that), & we’ll know the optimal timing for us to eat & drink as well, & whether certain supplements will benefit us or not. 5. The development of new foods & medicines will require ‘microbiome testing’ – i.e. how does that substance affect our microbial ecosystem when ingested? 6. Food farmers will use microbes instead of chemicals to control pests & keep soil healthy. 7. Your health professional will need to know your gut microbial profile before prescribing anything (whether it be drug, diet or lifestyle change). 8. Mental health issues will be much easier to diagnose, treat / control. 9. Chemicals for use in cleaning / agriculture / personal care products / household products will be examined for their microbial impact. 10. We will all use probiotic hand sanitisers, nasal sprays, bench wipes, moisturisers, hand creams, feminine hygiene products, deodorants, toothpastes…friendly microbes will be considered friends. 11. Rates of autism, ADHD & extreme childhood behavioural issues will start to decline. 12. Asthma, eczema & allergies will become rare. 13. Suicide, drug use & crime rates will drop. 14. The majority of our food will be organic, with minimal artificial additives as we know how sensitive our guts are to chemicals. 15. We’ll have a much better understanding of how our food impacts our mood, our health, our appearance…& we’ll eat accordingly. Teenagers will start eating veggies & fermented foods…& shun McDonalds, lollies & Coke, because it’s no longer just mum & dad hassling them – science actually proves that eating gut-supporting foods & avoiding nasties will make them happier, less pimply, pudgy / gangly / awkward. 16. Someone will develop a gluten free, low FODMAP bread that tastes great untoasted, as a sandwich & has no crappy ingredients (hopefully goodMix, next project?!) But will our guts all be so robust & healthy by then that sales will be poor? This is mostly imaginary (but definitely possible) stuff…mobile phones & Facetime were imaginary not so long ago too. We’ve only just started to seriously look into our guts & listen to them…just imagine what the next decade or 2 will bring!! !